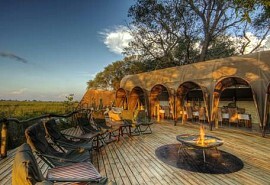 This classic luxury tented camp is sublime Botswana safari material. 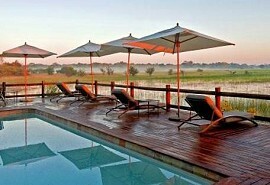 It has canvas tented suites, elevated on wooden platforms beneath mature riparian trees that line the water’s edge. Spacious interiors and ensuite bathrooms with simplistic timber furnishings and a neutral colour palette make these tented units the perfect retreat in the bush. The main lodge area makes the most of the lagoon frontage with an open fire pit under the night sky, a comfortable outdoor lounge on a shady deck, and dining options that either seat you overlooking the view, or right in the middle of the Botswana bush for a special meal. 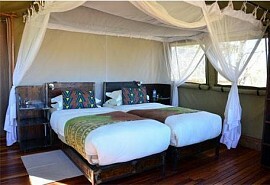 There are 18 tented rooms in total - 8 luxury river-facing tents, and 10 standard forest suites. All are ensuite with comfortable furnishings and privacy. There is a swimming pool, which offers cooling relief in the hot summer months, also with a view of the lagoon. 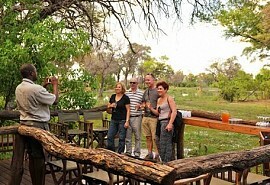 The bar is located in prime position of the view and is outward facing so that each seat looks out onto the bush. WiFi is available at the lodge so you can share your experiences with ease and in the comfort of the main lounge and living area. Saguni Safari Lodge is named after a Bushman word describing an area with an abundance of game and spectacular sights, which is certainly an apt name for the superb location of this lodge. 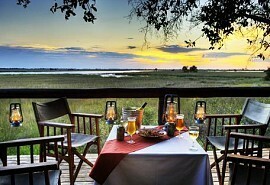 In the eastern Khwai region of Moremi Game Reserve, all the magic of the Okavango Delta spills out from the waterways and onto the fertile floodplains. Some of the most commonly seen wildlife species are elephant, lion, hyena, red lechwe, buffalo, leopard, giraffe, and zebra. The Mbudi Lagoon is part of the Sable Alley river system of Khwai, which is renowned for excellent sightings of birds and wildlife. Explore the waterways in greater detail on a mokoro excursion, guided by an expert of the area. Hippo and crocodile own the channels, while herons, storks, kingfishers, and fish eagles linger around the water’s edges where they can be seen and photographed endlessly. 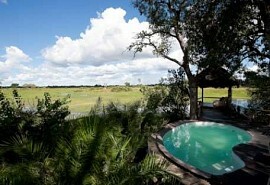 Game drives offer spectacular big game encounters Moremi is known for.